I was in Class X preparing for my Board exams. Those days, my best friend Amit Kumar was my saviour. Amit was always there for me, with his simplified notes and helped me during our evening group study sessions. On one such winter evening, I went to Amit’s home, which was right next to an old Hanuman Temple. After studying, Amit’s mother, coaxed me into tea and snacks. I was his son’s best friend, how could I go back home with eating anything! I too succumbed to the lure of the freshly fried pakodas. But this made me very late. It was already dark and the roads were almost empty. I was a little scared. I hesitated, but I walked towards him. He asked me my name. I replied, “My name is Ali.” In a flash of a moment, I felt a stinging slap on my face. I was in utter shock, unable to move or react. The other men in the group controlled him and asked me to run away. Years later, I am still recuperating from the shock. Why would somebody hate me without knowing me? Just because I am a Muslim? My next question is why would anybody hate another person on the basis of his/her religion? I am Ali Abbas, a social worker by qualification. I live in Hyderabad and work as a coordinator with an environmental NGO. 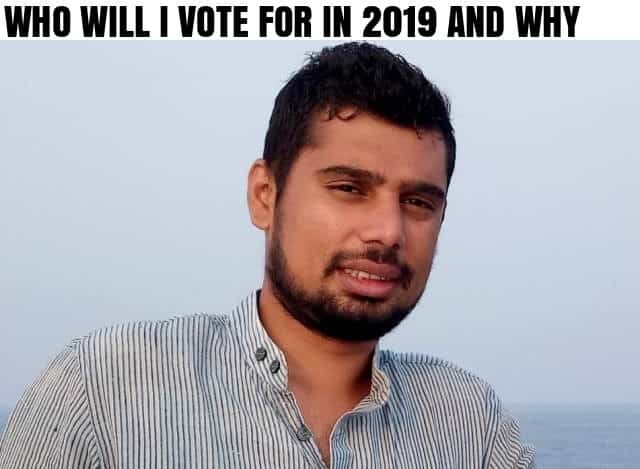 And this year, in the Lok Sabha Elections, my vote will go to anyone who can answer the questions mentioned above and put an end to the politics of hatred, which has become a norm these days. With just a few months left to the Assembly Elections, I decided to start a campaign against the politics of hatred, which seem to escalate before every election. I bet, even if you consider yourself a devout person, a true Indian and have some moral values, your head will hang in shame after reading these quotes. The context of these quotes does not matter. Nor does it matter, who said what. But what matters is– and at the same time is rather disturbing is the fact that in a secular democracy like India, this kind of hate-mongering is getting popular. It is a known fact that to reap political benefits certain political parties and politicians are playing Hindu-Muslim hate politics. The purpose of these hate politics is clear. It is to polarize people on the basis of caste and religion and force them to vote for a particular political party or a politician of a certain affiliation. And sometimes, politicians use it as a diversionary tactic to avoid/ circumvent crucial issues concerning the common people. With 93 attacks as till 26 December, the year 2018 saw the most hate crime motivated by religious bias in India in a decade. About 30 people were killed – the most since 2009 – and at least 305 injured in such attacks. What have we reduced our country to? The general election is round the corner and there is already rise in hate speeches by certain politicians. To cite an example from Telangana, my home state, T. Raja Singh, the lone Bharatiya Janata Party (BJP) MLA in the 119-member Telangana assembly, refused to take oath from Mumtaz Ahmed Khan, a six-time MLA from the All India Majilis-e-Ittehadul Muslimeen (AIMIM), who was appointed as the pro-tem speaker. Raja Singh is infamous for his speeches and had openly declared that he would not take oath from the Muslim pro-term speaker. Now, we have to decide whether we fall into the pit of hatred again or encourage politicians to talk about the issues which concern us, the common man? The Modi government recently tried paying some attention to the common man as well through the 10 percent quota in jobs for the economically weaker sections (EWS), but it just seems to be a populist stunt to garner votes. To implement a scheme like this, it very important to define the EWS category. The parameters set to define the EWS category can vary from place to place. For instance, a person with an annual income of Rs 8 lakh maybe considered poor in an urban area, but in a rural set-up, with low cost of living, it may be a different story altogether. Besides, does the government have the capacity to promise jobs to all candidates who fall under the EWS category? The central government for instance has 4 crore jobs, can it accommodate the 40 crore people through the EWS quota? Can it force the private sector to create these many jobs? How do we ensure demand and supply? These factor need to be thought through. After all, reservation for everyone is actually no reservation. India doesn’t need such populist measures. What India needs is for people to be more tolerant and cooperative led by politicians, who do not preach hatred. Ask yourself… what does an enemy of the nation want? That we are divided; we fight amongst ourselves and never develop. All those politicians spreading hatred for personal and political gains are the biggest enemies of the state. India needs ‘vikas’ but we cannot usher in development in an environment of intolerance, distrust and hatred. NARRATOR’S NOTE: Kindly support me in my campaign against Hindu-Muslim politics of Hate by signing the petition on Change.org Save India from Hindu-Muslim politics of Hate. I appeal you that next time you hear a hate speech by any politician, condemn it.